Download "AGENT(S) / APPLICANT(S): AGENT Dave Dickerson, DK Architects. APPLICANT Halton Housing Trust. DEVELOPMENT PLAN ALLOCATION: Greenspace." 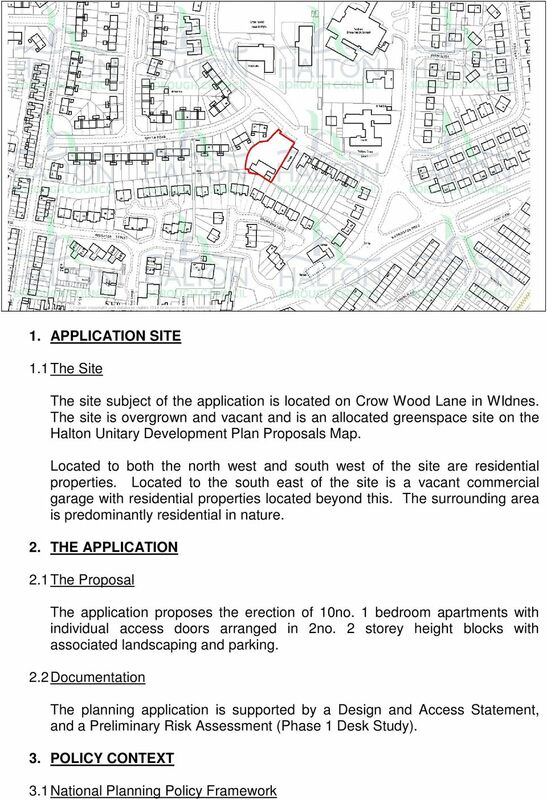 1 APPLICATION NO: 14/00168/FUL LOCATION: Land to the west of 19 Crow Wood Lane, Widnes. PROPOSAL: Proposed erection of 10 no. 1 bedroom apartments with individual access doors arranged in 2no. 2 storey height blocks with associated landscaping and parking. 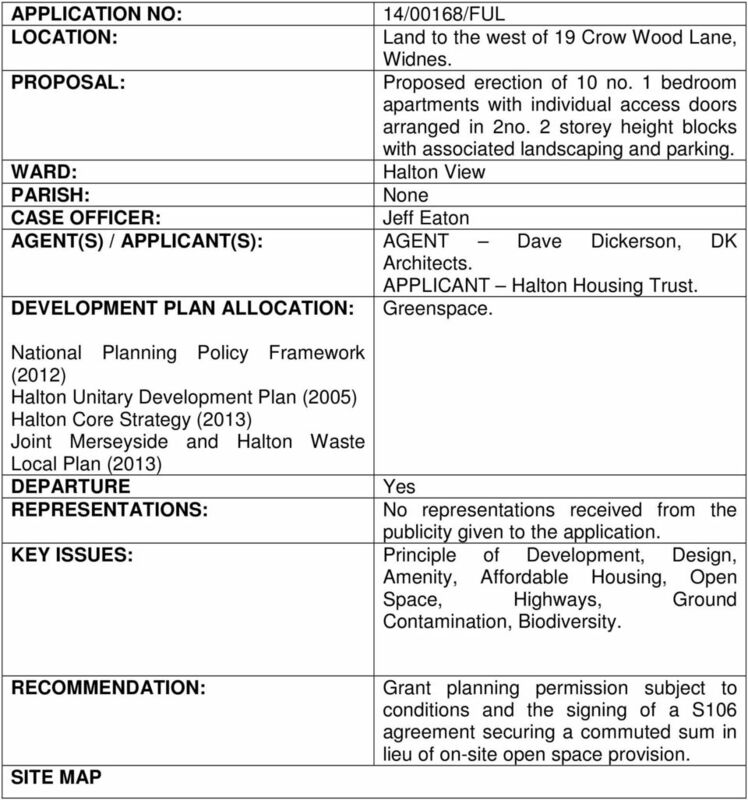 WARD: Halton View PARISH: None CASE OFFICER: Jeff Eaton AGENT(S) / APPLICANT(S): AGENT Dave Dickerson, DK Architects. APPLICANT Halton Housing Trust. DEVELOPMENT PLAN ALLOCATION: Greenspace. National Planning Policy Framework (2012) Halton Unitary Development Plan (2005) Halton Core Strategy (2013) Joint Merseyside and Halton Waste Local Plan (2013) DEPARTURE REPRESENTATIONS: Yes No representations received from the publicity given to the application. KEY ISSUES: Principle of Development, Design, Amenity, Affordable Housing, Open Space, Highways, Ground Contamination, Biodiversity. 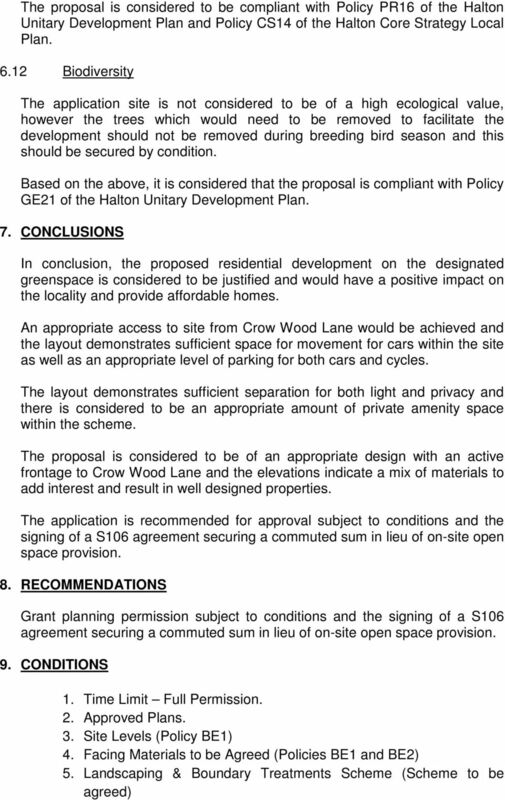 RECOMMENDATION: SITE MAP Grant planning permission subject to conditions and the signing of a S106 agreement securing a commuted sum in lieu of on-site open space provision. 4 WM9 Sustainable Waste Management Design and Layout for New Development. 4. CONSULTATIONS 4.1 Highways and Transportation Development Control No objection to the proposed development subject to the attachment of a number of conditions. 4.2 Open Spaces Officer There are several trees scattered around the site which are mostly semi mature but of low amenity value. There are a few mature specimens (one holly and two fruit trees located in the centre of the site) but they appear to be in poor condition and again have limited value. The other notable feature on the site is the mature privet hedge to the front of the site but it is not long enough or diverse enough to qualify for hedgerow regs. There is no vegetation worthy of retention on this site; however any clearance works should comply with current bird nesting legislation. 4.3 Environmental Health Ground Contamination No objection to the proposed development subject to the attachment of a condition which would secure a site investigation, remediation plan and a completion statement. 4.4 Environmental Protection No observations received at the time of writing this report. 5. 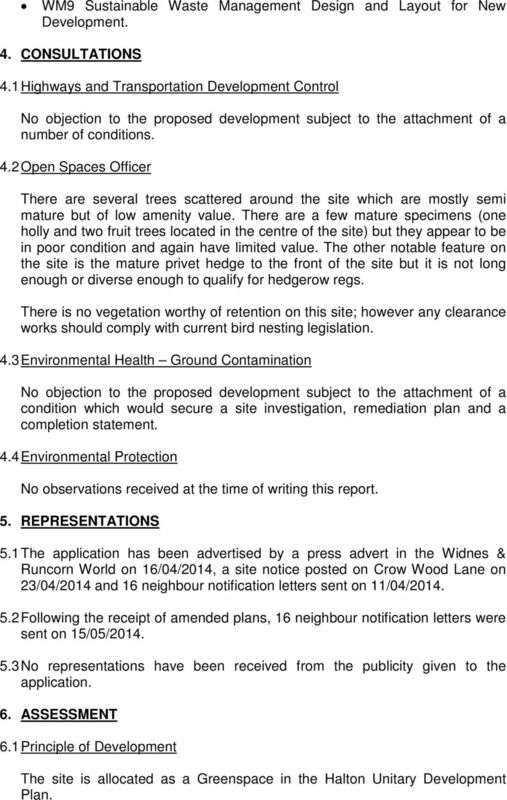 REPRESENTATIONS 5.1 The application has been advertised by a press advert in the Widnes & Runcorn World on 16/04/2014, a site notice posted on Crow Wood Lane on 23/04/2014 and 16 neighbour notification letters sent on 11/04/ Following the receipt of amended plans, 16 neighbour notification letters were sent on 15/05/ No representations have been received from the publicity given to the application. 6. 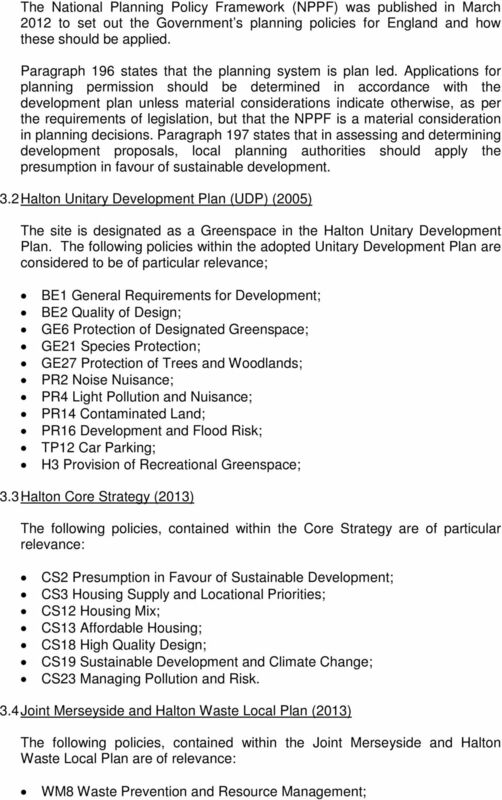 ASSESSMENT 6.1 Principle of Development The site is allocated as a Greenspace in the Halton Unitary Development Plan. 7 The application site is located within a predominantly residential location and it is considered that the proposed development would be acceptable from a noise perspective. 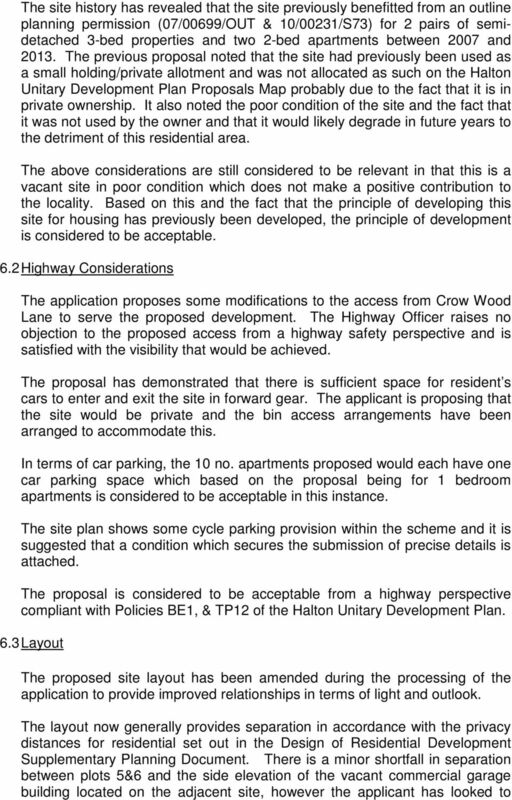 The proposal is considered to be compliant with Policy PR 2 of the Halton Unitary Development Plan. 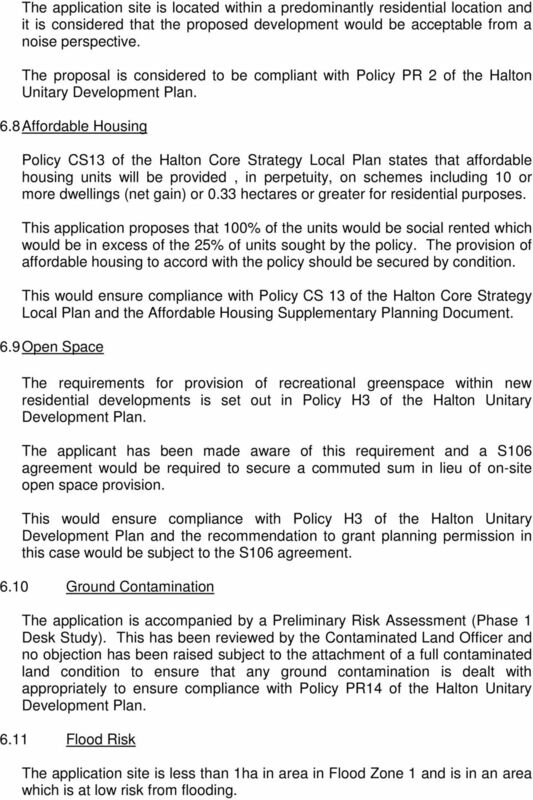 6.8 Affordable Housing Policy CS13 of the Halton Core Strategy Local Plan states that affordable housing units will be provided, in perpetuity, on schemes including 10 or more dwellings (net gain) or 0.33 hectares or greater for residential purposes. This application proposes that 100% of the units would be social rented which would be in excess of the 25% of units sought by the policy. The provision of affordable housing to accord with the policy should be secured by condition. This would ensure compliance with Policy CS 13 of the Halton Core Strategy Local Plan and the Affordable Housing Supplementary Planning Document. 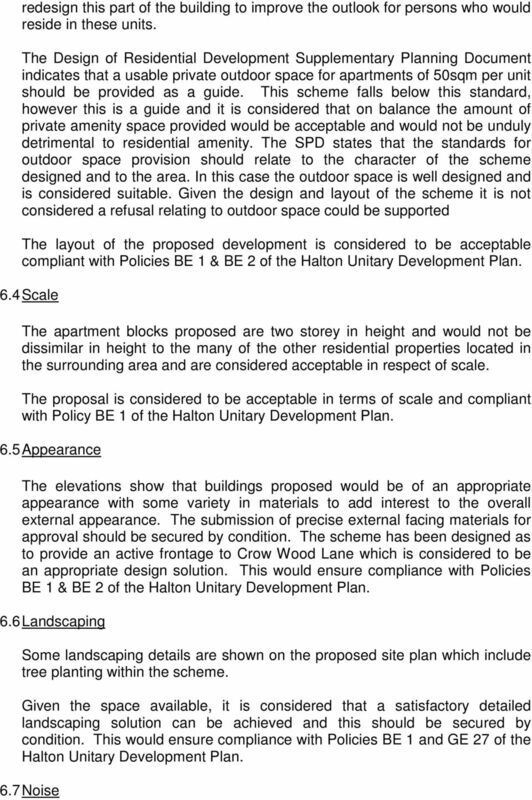 6.9 Open Space The requirements for provision of recreational greenspace within new residential developments is set out in Policy H3 of the Halton Unitary Development Plan. The applicant has been made aware of this requirement and a S106 agreement would be required to secure a commuted sum in lieu of on-site open space provision. This would ensure compliance with Policy H3 of the Halton Unitary Development Plan and the recommendation to grant planning permission in this case would be subject to the S106 agreement Ground Contamination The application is accompanied by a Preliminary Risk Assessment (Phase 1 Desk Study). This has been reviewed by the Contaminated Land Officer and no objection has been raised subject to the attachment of a full contaminated land condition to ensure that any ground contamination is dealt with appropriately to ensure compliance with Policy PR14 of the Halton Unitary Development Plan Flood Risk The application site is less than 1ha in area in Flood Zone 1 and is in an area which is at low risk from flooding. 9 6. Breeding Birds Protection (Policy GE21) 7. Protection of Trees Construction Phase (Policy BE1) 8. Hours of Construction (Policy BE1) 9. Dust Suppression During Construction (Policy BE1) 10. Construction Management Plan (Highways) (Policy BE1) 11. Wheel Wash (Policy BE1) 12. Provision of Affordable Housing (Policy CS13) 13. Ground Contamination - (Policy PR14) 14. Visibility Splay (Vehicles) - Junction with Crow Wood Lane (Policy BE1) 15. Provision & Retention of Parking - (Policy BE1) 16. 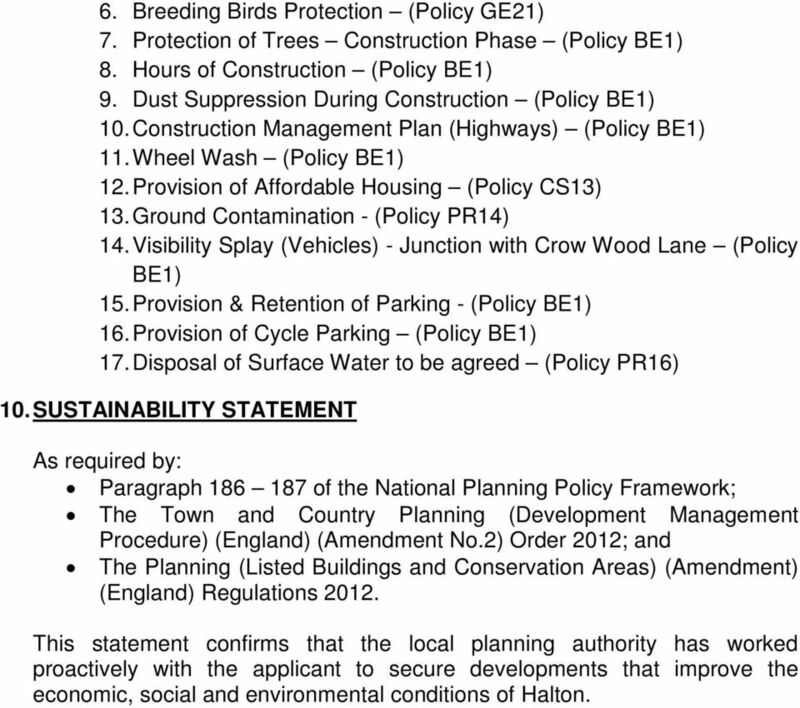 Provision of Cycle Parking (Policy BE1) 17. Disposal of Surface Water to be agreed (Policy PR16) 10. SUSTAINABILITY STATEMENT As required by: Paragraph of the National Planning Policy Framework; The Town and Country Planning (Development Management Procedure) (England) (Amendment No.2) Order 2012; and The Planning (Listed Buildings and Conservation Areas) (Amendment) (England) Regulations This statement confirms that the local planning authority has worked proactively with the applicant to secure developments that improve the economic, social and environmental conditions of Halton.